The best things in life are free, as the saying goes. South Carolina aims to keep it that way by offering an abundance of no-cost activities everyone in the family can enjoy. If you’re strapped for cash, or simply tired of whipping out the credit card everywhere you go, check out these 15 best free things to do in South Carolina. They can make you—and your bank account—very happy. Not only does walking cost zero dollars, it’s also a healthy habit! Get your daily exercise as you saunter past beautiful waterfalls or over the iconic suspended bridge overlooking the Reedy River. There plenty of offshoot paths that twist along the water’s edge, leading to shaded swings or benches if your feet need a rest. There’s even a direct foot route to the Greenville Zoo, where you will find a large outdoor playground where kids can play for free—no zoo admission needed. We all need a little fresh air now and then, and there’s no better in South Carolina than in the great outdoors at Oconee Station State Park. Follow the trail to the waterfall, or simply hang around the two historic buildings that put Oconee Station on the map of historic landmarks. You could even bring a picnic for an alfresco lunch. Bring your binoculars, there’s a lot more wildlife than just birds here. This wildlife preserve used to play home to the Sea Cloud and Bleak Hall plantations in the 1800s. Now, the area serves as the perfect viewing area for birds, sea turtles, ducks, ocean dwellers, and plant life. Can you find all nine tiny mice sculptures on Greenville’s Main Street? It doesn’t cost you anything to try! Established in 2000, Jim Ryan’s brainchild of adding the small mice figures to Main Street came to him through a reading of the children’s book “Goodnight Moon,” in which there are nine mice hiding throughout the pages. After careful fundraising, research, and commissioning, nine little mice dot the main thoroughfare of downtown Greenville, spanning from the Hyatt to the Westin Poinsett. This little scavenger hunt is a great way to spend a warm, sunny afternoon. If you’re in need of some beach therapy, head to the famed Grand Strand, where you can have your pick among some of the best beaches along the east coast. 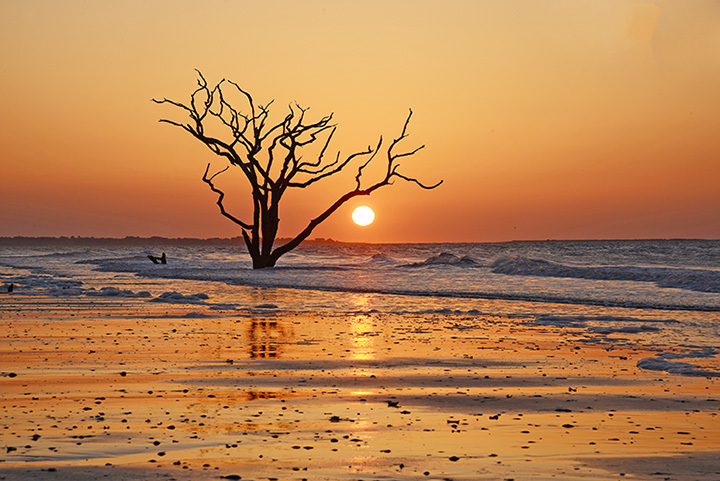 From bustling North Myrtle Beach down to the quiet, laidback shores of Pawley’s Island, there’s plenty of sand and surf to go around—and admission to any of the beaches is completely free. BMW Zentrum combines history with things that go fast to create a unique experience for lovers of all things cars and technology. On display are some of BMW’s car designs throughout the years, along with exhibits of their leading-edge innovations that make them so famous. Who knew history could be so thrilling? Do you believe in miracles? God’s Acre Healing Spring may have provided one to four critically injured British soldiers during the American Revolution. These dying soldiers were dead and buried, but six months later returned to their camp in good health. It sounds too crazy to be true, but you can still find people splashing about in the waters today, perhaps hoping to drink their own little miracle. It doesn’t hurt to try, especially since visiting the spring is free. Hop aboard the open-air trolley and take a little sightseeing tour of downtown Greenville. The trolley makes stops at some of Greenville’s most popular attractions, like the Children’s Museum of the Upstate and Fluor Field, but it also gives you a chance to glimpse life in the big city without having to watch for traffic. The city of Charleston is teeming with early American history, and there are plenty of landmarks and other sites to see within walking distance of each other. You can spend a day or a week perusing the streets of Charleston’s historic district, enjoying free adventures like browsing Charleston’s City Market, explore the Battery Park or the Battery Carriage House Inn, snap some pictures at Rainbow Row, walk around the Charles Pinckney plantation, or dash across the famed Cooper River Bridge. There are also companies who offer walking tours where you can name your own price—and yes, free is a price. Yes, the name says Children’s Garden, but it can be fun for adults, too. This free outdoor garden houses interactive activities, a geology wall, a Hansel and Gretel-style cottage, secret garden, and a textile garden. As one of the (very) few free museums in the state, visitors to the Museum of Art can explore and enjoy all the unique watercolors, sculptures, pastels, portraits, and other works that have ties directly to the south. They also offer workshops, performances, and other special events throughout the year. It should come as no surprise that alligators are found in coastal towns like North Myrtle Beach. What is surprising is that many of these gators have made their home in one of the Grand Strand’s premiere shopping destinations—Barefoot Landing. Situated on a large lake, numerous boardwalks connect the different areas of the shopping mecca. But if you look closely enough, you can find a few gators lurking in the water under restaurants and stores. Luckily, there have been plenty of safety measures put into place, blocking off the alligators’ access to human-occupied areas. Campbell’s Covered Bridge is the only bridge of its kind still standing in South Carolina. Erected in 1909, this covered bridge crosses a small river. Covered bridges were popular over a century ago, but with today’s traffic and bulky transportation methods are no longer practical. Visitors can bring a picnic and explore the remnants of the nearby grist mill. Beautiful flowers, fountains, bridges, walkways, and more - what else could you need for a day in the great outdoors? Glencairn Gardens once started as someone’s backyard garden project, but has now grown to an 11-acre utopia that continues to grow each year—literally. Meticulously crafted and well-kept, visitors can enjoy fresh air, fine sights, and free admission.